Confirming the rumors, New Line has announced a late-July Blu-ray debut for the cult classic 'Dark City,' which will hit high-def in a brand-new "Director's Cut." 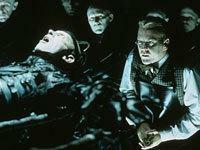 Speculation on a possible 'Dark City' high-def release had the web buzzing last month, after director Alex Proyas dropped hints that New Line was retooling the film for a new video release, though the studio remained mum on any plans. Now New Line has confirmed that the 'Dark City: Director's Cut' will debut on Blu-ray July 29, day-and-date with a new standard DVD re-issue. There are no tech specs or supplement details as of yet, but we'll report more as further details are announced for what is sure to be one of the most anticipated Blu-rays of the season. Suggested retail price for the Blu-ray has been set at $34.98. You'll find preliminary specs for 'Dark City' linked from our Blu-ray Release Schedule, where it's indexed under July 29. We've also set up a dedicated thread for New Line's latest in our Forums area -- click the following link to discuss the 'Dark City' Blu-ray release.